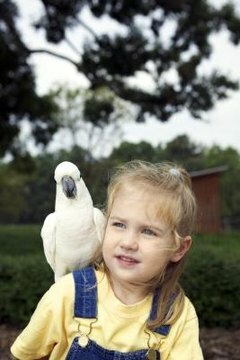 Protein helps cockatoos build healthy tissues during their growth periods as well as during reproduction and breeding. Wild cockatoos seem to know their bodies' needs instinctively and seek high-protein foods at appropriate times. Cockatoo pets don't have that luxury, depending instead on their humans to make sure their diets include protein-packed choices. Cockatoos love beans. Beans pack a powerful protein punch and are low in calories. Like people, though, 'toos can get stuck in feeding ruts, eating the same couple of varieties because they're what are offered to them. Break out of bean boredom by including garbanzo, pinto, kidney and black beans, as well as split peas and lentils. Beans must be cooked, so experiment with textures -- from still firm to mushy -- to see what your cockatoo prefers. Try adding a little cayenne to soft bean mixtures; many parrots love the taste. Birds in nature gravitate toward eating more insects when their bodies need more protein. But there's no need to catch beetles or flies for your cockatoo. Offer a small amount of broiled, roasted or grilled chicken and turkey at least twice a week. Start with a small piece and add more if he likes it. Stick to leaner white meat, as dark meat has more fat. Remove any leftovers after an hour so the meat doesn't spoil. Lean fish such as salmon, trout, tuna and halibut are excellent protein sources and offer the variety every bird's diet needs. Tuna has more protein and less fat than salmon; canned, water-packed tuna has slightly more protein than tuna steak. If weight isn't a problem, alternate fish with hard-boiled eggs a few times a week. Give more of the healthier whites than the fattier yolks in a ratio of a about 3 to 1. Nuts are a good source of protein; most birds enjoy cracking their shells and plucking out the nuts. Depending on a cockatoo's dexterity and the hardness of a nut's shell, you may need to partially crack it for the cockatoo to get to the nut. Almonds are highest in protein, followed by hazelnuts, peanuts and pistachios. Peanuts can deteriorate quickly and contain bacteria, however, so crunchy peanut butter is a good alternative. According to researchers at Stanford University, birds' food preferences depend on what they ate as hatchlings. If a mature bird wasn't fed a diet that included protein early in his life, he may be resistant to eating such foods. Don't give up if he doesn't bite right away. Continue to provide his usual diet, just keep adding one new food at a time. Rotate between new protein foods until he tries one he likes. Continue to offer that food while experimenting with others. Soon, he will have a revised, healthier diet.